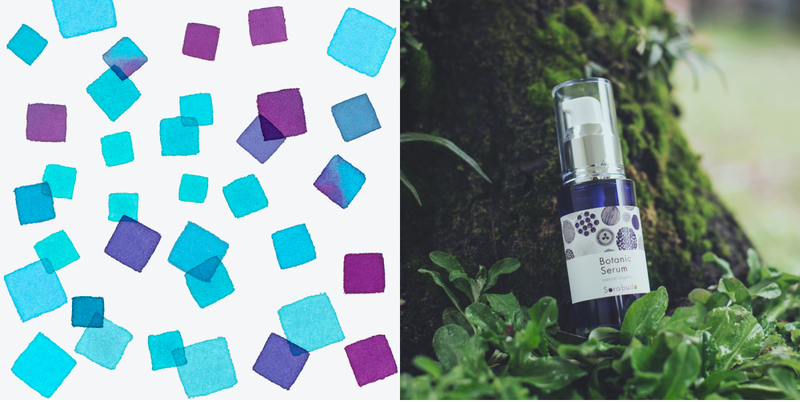 Sorabudo delivers skin with all the moisture and resilience of fresh fruit. Harboring large amounts of moisture within its fruit, the grape plant is able to thrive beautifully even in dry environments. Similarly, we also need moisture in order to have naturally beautiful skin. Skin starts out with the ability to healthily preserve its moisture on its own. Sebum, which keeps moisture from evaporating out of the stratum corneum, natural moisturizing factor (NMF), which preserves the moisture present within the stratum corneum, and intercellular lipids (ceramides) are responsible for this moisture preservation. Skin with high levels of these three components possesses an effective barrier that protects against dryness and external irritation. People with sensitive skin, however, are deficient in these elements, lowering the effectiveness of the skin’s barrier. If levels of even just one of these three components are too low, the skin’s moisture and the effectiveness of the barrier cannot be maintained. What’s more, the levels of these elements decrease as the skin ages. This is one of the reasons that we face more and more skin issues as we get older. Sorabudo is designed to address these concerns. It promotes the skin’s natural moistness and barrier effectiveness, helping to achieve moist, resilient skin. Yeast extract is packed with a concentration of components needed for beautiful skin. The amino acids in yeast extract attract moisture, helping to improve the effectiveness of the skin’s barrier and restore damaged skin to health. The high levels of vitamins present help to regulate the dermal rhythm and sebum secretion and promote a healthy dermal environment. In these ways, yeast extract provides support for the functioning of skin that has weakened with age. All Sorabudo products are designed to offer these yeast extract benefits. Water is the basic component of many skincare products. 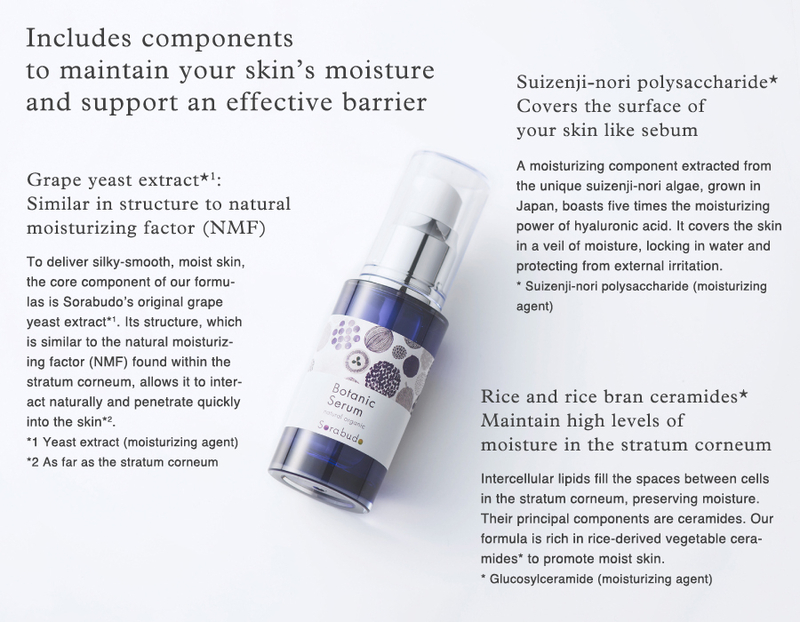 In place of water, Sorabudo is formulated using generous amounts of grape yeast extract. From lotions and milks to serums and creams, water is the base for many skincare products. However, in order to deliver products that take full advantage of the inherent power present in our naturally-sourced components, we use generous amounts of grape yeast extract* in place of water to maximize the effectiveness of our products.. This allows us to create a lotion with a high ratio—almost 90%—of grape yeast extract*. Our formulas are based only on naturally-sourced materials. Made by extracting components beneficial to the skin from naturally-sourced materials, Sorabudo cosmetics are extremely close to nature. We even insist on using only naturally-sourced “carryover” components, which are added during our extraction and stabilization processes and are not required to be disclosed. Our top priority is providing products that are easy on the skin, and we use absolutely no alcohols, synthetic fragrances, coloring agents, petroleum-based surfactants or other materials which can cause stress to the skin. 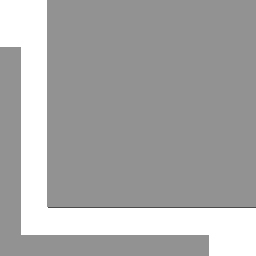 The materials used in a cosmetic are critical elements that determine its quality. That is why our Sorabudo quality standards designate the use of natural plant-sourced, organically-grown and organic JAS-certified materials, with ingredients that cannot be sourced in these ways made directly by ourselves. In addition, we believe that the items we use on our bare skin should be held to the same standards as the food we put in our bodies, and we have incorporated traceability standards covering production and manufacturing history. We even harness the power of nature to keep our products fresh. We pride ourselves on our completely organic cosmetics, made without even a single drop of any substances that cause stress to the skin, and needless to say, we do not use any synthetic substances to preserve the quality of our products. We carefully select and use naturally-sourced materials with effective preservative properties, such as wasabi root ferment extract and daikon radish ferment extract. Immediately squeezed and extracted under high pressure and low temperature after harvest. 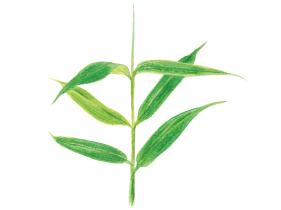 This is a pure extract from the Sasa kurilensis plant as no substances are added in the process. It is rich in minerals and excellent as a mosturizer. 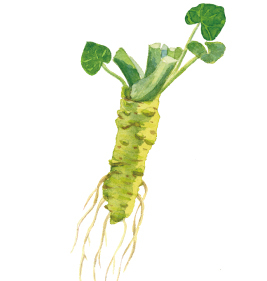 The extract of the wasabi root, well known for its bactericidal properties, is fermented using a lactic acid bacteria called lactobactillus. 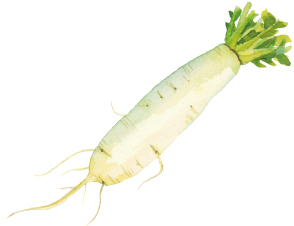 The extract obtained from the Japanese radish is fermented with the lactic acid bacteria leoconostoc, and subsequently filtered. This removes impurities and odors to achieve its current state of purity.